Dada Corner (Room 3, south wall), Institute of Archeology of the Hofgarten, Munich 18th July 1937 Works from left to right: "Das Paar" by Ernst Ludwig Kirchner, "Der Abenteurer" by George Grosz, "Schwangere" by Christoph Voll, the mural is copied from Wassily Kandinsky's painting; "Der Schwarzer Fleck", surely taken from a reproduction. On the left is the painting by Kurt Schwitters "Merzbild" and next to it, "Ringbild", and under the picture "Sumpflegende" by Klee, the cover of Der Dada No. 2 and page 3 of No. 3 by Raoul Hausmann. At the top a phrase by George Grosz "Take Dada seriously, it's worth it". On the wall on the right at the top there is a painting by Kandinsky "Zweierlei Rot" and below this the picture "Telltow" by Lyonel Feininger. On the floor there is "Das Figur" by Rudolf Haizmann; on the corner "Das Ich" by Oswald Herzog and almost off the page "Tanzerin" by Margarethe Moll. Dada came to the world during the Great War to stay; the virgin microbe that spread throughout Europe suffered a severe setback shortly before the Second War with the humiliating exhibition Entartete Kunst. The most interesting art produced in the first third of the twentieth century that were in the museums and galleries of Germany was now shown with derision, hung carelessly in the arcades of the Archaeological Institute of Munich from 19th July until the end of November. Although it is true that never had so many public, two million people, compared to a few thousand who visited the other simultaneous exhibition, the First Exhibition of German Art, which took place in the newly opened House of German Art. Prison, death and exile scattered a whole generation but we could not understand the art of the second half of the 20th century and the 21st century without Dada. The words that Tzara dedicated to Schwitters when he died in England could be applied to himself and many of the women and men infected by this virgin microbe. "[Schwitters] is one of those who have cut off the praised capital A from the word art and have put that word back on the level of human manifestations". In 1941 André Breton embarks on his way to America fleeing from the occupation of France, but he is retained in Martinique by the Vichy Government and interned. He is released on bail and begins his exile in New York. Trying to recompose the surrealist movement, in 1942 he founded the magazine VVV (Victory, View, Veil) with David Hare, of which four issues are published. In number 2-3, published in March 1943, Marcel Duchamp collaborates, who was again in New York. This trip was a real odyssey, because when he already had the permits and the Arensberg's invitation in 1941, at the US consulate in Marseille he was asked for a new invitation, which this time came from Katherine Dreier. Finally he embarked in Marseille with destination Casablanca in March 1942 and there waits for days for a plane to travel to Lisbon (something reminds us of the plot of the film that was filmed that same year, in which "Everybody comes to Rick's", and we can imagine him playing chess with Rick Blaine). At last he arrives in Lisbon and in June he embarks towards New York. Schwitters fled to Norway on 2nd January 1937, but when the Nazis invaded Norway in April 1940 a new exile began. 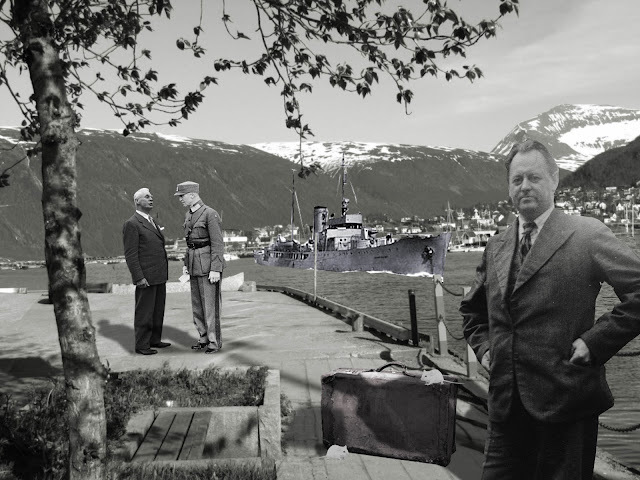 Kurt Schwitters about to embark for Scotland on 8th June in the port of Tromsø in northern Norway with two white mice and a suitcase. In the background, the icebreaker Fridtjof Nansen. 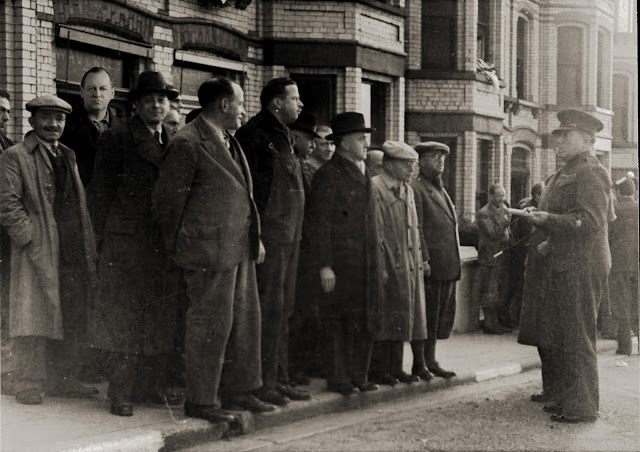 He was accompanied on this trip by his son Ernst, his Norwegian daughter-in-law Esther, some twenty-five German anti-Nazi refugees, Norway's Chancellor Halvdan Koht (bottom left) and General Carl Gustav Fleischer, who is arguing with the Chancellor. The Fridtjof Nansen arrived at Tórshavn in the Faroe Islands on 13th June and left three days later for Scotland accompanied by Norwegian warships and a British destroyer ship. In Scotland all exiles were arrested and interned in different camps throughout the United Kingdom. 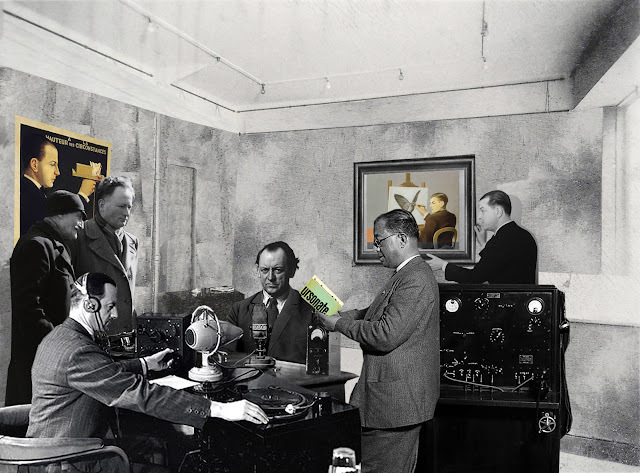 Kurt Schwitters made his first recitals at the Artists Café organized by Fred Uhlman. The Café was set up in the laundry, while some inmates hung their underwear to "bother" the "customers." Schwitters could be found almost every day in the Café chatting with Hellmuth Weissenborn, illustrator and engraver. There Schwitters was in his element telling anecdotes of his Merz soirees in Holland and Prague and his travels in Norway. He recited his poems that he knew by heart and had an enthusiastic audience for his Anna Blume, poem for a stutterer or the poem Silence (his first poem in English), making circular movements with a cup and its saucer while he kept saying Silence, Silence every time shouting it louder and suddenly SILENCE cried out and threw the cup and saucer to the ground screaming SILENCE SILENCE; it was a cathartic action for those inmates who were treated as enemies. The soirée concluded with the Ursonate which became a tribal greeting. The following day the inmates when they met some said Lanke trr gll pii pii pii pii and the others answered ooka, ooka, ooka. 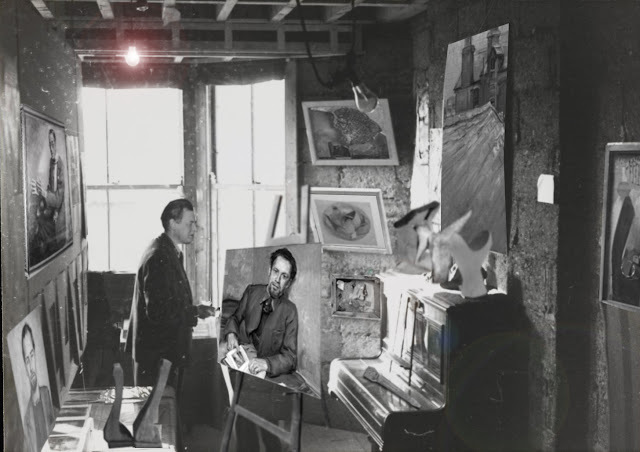 Kurt Schwitters in the improvised studio in the 19 house of the camp. He is giving a few touches to a portrait of Fred Uhlman. On the left wall portrait of Rudolf Olden and below the historian Klaus Hinrichen, who was the one who organized the art exhibition in the camp. We also see several Merz collages, some chair legs and sculptures he was elaborating at the time with porridge. Jack Bilbo (Hugo Cyrill Kulp Baruch) was also interned in the Isle of Man in 1940, but in the Onchan Camp. He left before Schwitters and in 1941 in a London bombed in the middle of the war, he opened the Modern Art Gallery. In January 1944 Schwitters participated in a collective exhibition in this gallery and on 4th December 1944 the exhibition "Painting and Sculpture by Kurt Schwitters" (The Founder of Dadaism and Merz) was inaugurated in the Modern Art Gallery. In the image we see Jack Bilbo, Kurt Schwitters and Herbert Read, the most influential art critic at the time, who wrote the introduction to the catalogue. 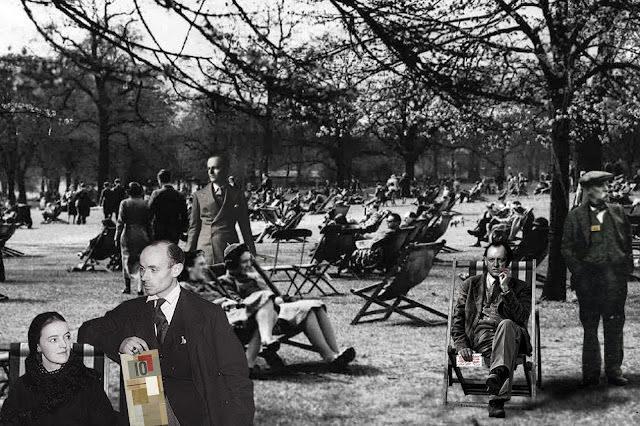 This was the first and last individual exhibition of Schwitters alive in England. "I was saddened by the hopelessness of my situation and this lounger seemed as helpless as I was. Life is sad. Why did the director of the National Gallery refuse to see me? He does not know that I belong to the vanguard of art. That is my tragedy... But it's not just bad to be in a situation like this. I feel the strength growing in myself. I'm not afraid to ask people for something. I know they are not afraid to say no. And so I asked a man (to Schwitters right) who was passing by if he had a pencil to write this. He wanted to give me a penny, but I told him I could not write with a penny. Then he understood and gave me a wonderful red pencil called the Royal Sovereign... Life in parks is more interesting than in the homes of well-situated and satisfied citizens". Art critic Christof Spengemann, an intimate friend of Schwitters from the time of Sturm in 1918, was arrested and imprisoned by the Gestapo in 1936 for participating in a SPD demonstration, to which Schwitters was also affiliated. It was the trigger for the preparation of his exile a few months later. After Christmas 1945 he learned that his old and precious friend was alive and well. Others also contacted Kurt, Raoul Hausmann, Hans Richter, Walter Gropius, Hannah Höch and many more. In one of the letters he wrote to Spengemann he tells the anecdote of the swan and the clock. In May 1946, a Rolls Royce with a chauffeur came looking for Schwitters, he had a commission in Grasmere to paint a portrait of Mrs. Horner, who would pay the exorbitant sum of thirty Guineas. But all were difficulties, Mrs. Horner refused to pay in advance and the sessions were interrupted with pauses and constant delays. 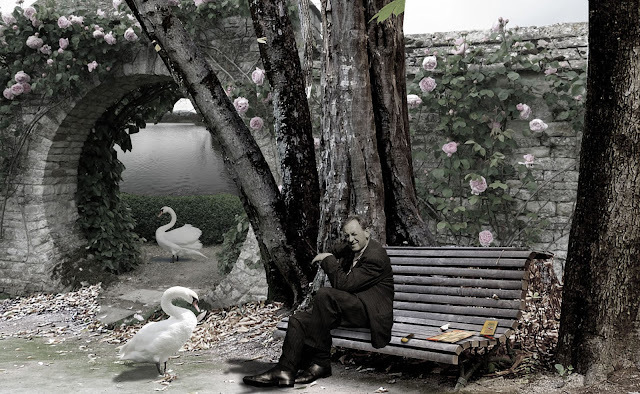 In one of those breaks Schwitters took a picnic near the lake and there a swan swallowed his silver watch. He informed the town hall and the police to arrest the swan, but the swans are above the law, they are the Crown of England property. The news ran like wildfire, even was published in the press. Someone saw a dead swan and Schwitters insisted the autopsy to be done. The clock never appeared. Dr. Johnston gave him a new watch. Mrs. Horner's painting was never finished. On 5th and 7th March 1947, Edouard Léon Théodore Mesens (E.L.T. Mesens), director of the London Gallery, who worshiped Schwitters, organized two Merz soirees at the gallery, in which Schwitters recited a version of Anna Blume in English, Eve Blossom, and the Ursonate. He invited two producers from the BBC to make a recording. Between the two evenings only twenty-five people attended and the gentlemen of the BBC left the recording and the gallery halfway through the recital. In the image, besides the two people from the public and the BBC technicians, we see Schwitters sitting in the centre disappointed and E.L.T. Mesens in the background on the right holding the picture Clairvoyance painted by René Magritte in 1937; and on the left another portrait of Mesens also painted by Magritte in 1930. Mesens described those nights: "I'm not exaggerating if I say there was a total lack of interest!... Schwitters recited with all his magic and then he was charming, never letting himself be discouraged..." Schwitters returned the following day to the Lake District to become a countryman. Ten months later he died. Schwitters with his girlfriend Edith Thomas (he called her Wantee - do you want tea?). In June 1945 they left London and went to live in the Lake District in Ambleside. Although he continued making Merz collages, which did not interest anyone, he painted landscapes and tried to sell them at the Ambleside tourist attraction the Bridge House, he would sit on the steps several hours a day offering his works to passers-by. At the beginning of January 1946, Schwitters met a soldier who had been in Hanover and found out that most of his hometown had been destroyed, when he gets home he receives the news that his mother had died. Wantee and Kurt had to collect firewood to warm themselves, coal was scarce. Kurt caught the flu and became seriously ill and then had a brain haemorrhage, lost his sight for two weeks, recovered surprisingly fast, and wrote to Edith Tschichold and Hans Arp, "weeds never dies". He was taken cared and pampered by Wantee and Doctor George Ainslie Johnston. He offered to paint a portrait to the Doctor in gratitude for his care, but he did not imagine him posing for hours, so it occurred to him that they would play chess when they had time and paint him at that times. "I do not know whether to let him win and then he would have a happy expression, but people will think that I am a bad chess player, or try to beat him, but it is possible that his expression then will be hostile and people will think that I am a bad painter". It is not known who won the game; the painting is now at the Armitt Museum in Ambleside. 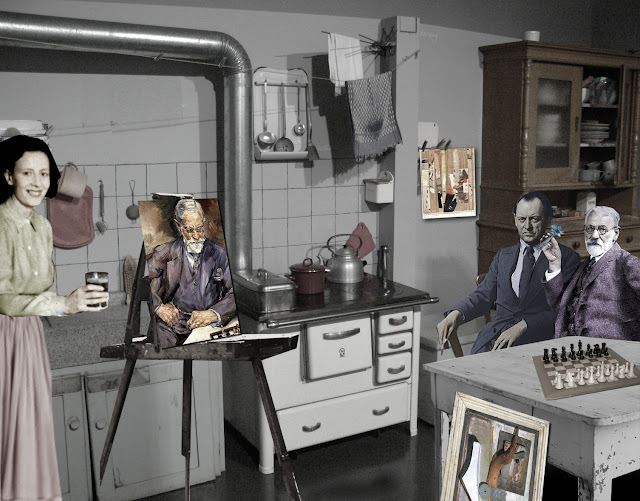 In the image Wantee suddenly enters the plane on the left, the painting on the easel, Schwitters and Doctor Johnston. During the war, Schwitters had news from Hannover through Edith Tschichold who lived with her husband Jan in Basel, Switzerland; in 1932 Jan had designed the typeface for the edition of the complete Ursonate in number 24 of the magazine Merz. Helma Schwitters used to write to Edith and she would write to Kurt. He learned through her of the destruction of his house in Waldhausenstrasse, 5 and in addition to numerous works, the Merzbau was also destroyed (the night of 8th October 1943). A year later, in December 1944, Edith wrote him a telegram with the news of Helma's death. When the war was over, Christof Spengemann wrote him that it was possible to rescue part of the Merzbau from the ruins; this news had him excited for a long time. He received an offer from the MoMA in New York to restore the Merzbau. He already imagined travelling with Wantee to Hanover, to Norway to meet his grandson and recite the Ursonate in New York. But his illnesses came one after the other and he also did not have a passport. In 1947 Jan Tschichold was hired by Penguin Books to redesign his popular series of paperback books. When Edith arrived in England with her husband, she went to visit Schwitters at Ambleside, a week earlier Schwitters had had a pulmonary haemorrhage. The visit of Edith Tschichold and the achievements of Jan greatly stimulated Kurt, although he was confined to bed, and considered the idea of making a new Merzbau in England. Landscaping gardener Harry Pierce, from Langdale, asked Schwitters in Ambleside, early in the summer, to paint a portrait. Pierce put at his disposal a destroyed barracks in Cylinder Farm, in Little Langdale, an old powder keg and there, with the help of Wantee, Pierce and his new friend Hilde Goldschidt began his new construction (in the image). Here we see him posing and proudly showing in his pocket the $ 2,000 check he had just received from MoMA. But Schwitters fell very ill that winter and died on 8th January 1948. The funeral was paid for with that money and that same afternoon the Ambleside police presented themselves with a British passport for Schwitters. On 19th January, an individual exhibition of his Merz Collages, organized by Katherine S. Dreier with an introduction by Naum Gabo, was inaugurated in New York at the Pinacotheca Gallery. His tomb remained without any inscription until 1966, Wantee put a tombstone with a simple inscription, Kurt Schwitters - Creator of Merz, but this tomb is now empty as on 18th August 1970 his remains were exhumed from the cemetery of Ambleside and on the 9th September were buried in the Engesohde cemetery in Hannover, relatively close to Waldhausenstrasse. A reconstruction of his favourite sculpture Herbstzeitlose of 1920 (Colchicums (autumn crocus): autumn saffron, which would mean that one who does not live to enjoy the autumn of his days - to the right of the image) that Kurt had planned to place on his grave when he died, and that the parish priest of Ambleside did not authorize at the time, was placed on top of a pedestal that in addition to his date of birth and death has the following inscription: "One never knows". New York, The Pinacotheca Gallery, 19th January 1948. A few days after the death of Kurt Schwitters in Ambleside, England, his first solo exhibition is held in the United States thanks to the tenacity of Katherine S. Dreier (in the photo). When Schwitters was ill, at the end of December 1947, Katherine sent him a package of money, vitamins and sweets from the United States to brighten up his life when he recovered. Their relationship came from many years ago, in 1920 Dreier created the Société Anonyme with the help of Duchamp and Man Ray to promote avant-garde art, that same year he travelled to Europe looking for artists to exhibit in New York. At the Sturm Gallery in Berlin he sees for the first time the Schwitters Merz collages and buys several. In the magazine New York Dada of Duchamp, April 1921, we can see on the last page the announcement of an exhibition: DON 'T MISS, Kurt Schwitters and other ANONYMPHS at the SOCIÉTÉ ANONYME, INC. The work of Schwitters was exhibited in the following two decades in more than thirty occasions. Dreirer personally visited Schwitters in Hanover in 1925, she spoke fluent German and a deep friendship emerged with Helma and Kurt Schwitters thereafter. She settled in Hanover for several weeks and travelled with the Schwitters to Prague, visiting the Bauhaus in Dessau and went on holiday to Holland. She appointed them as her agents to search for German artists and send their works to exhibit in New York. In 1929 Duchamp accompanied him to Hanover and bought twenty-five paintings from Schwitters. The American press never appreciated Kurt's work, they thought that an eccentric woman exhibited works of even more eccentric Germans. 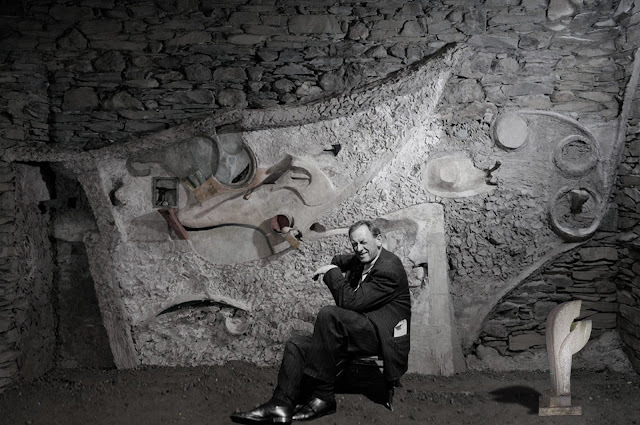 Aldred Barr, director of MoMA, had planned to have an exhibition with Schwitters' work in 1947, but it was postponed several times due to Kurt's poor health. 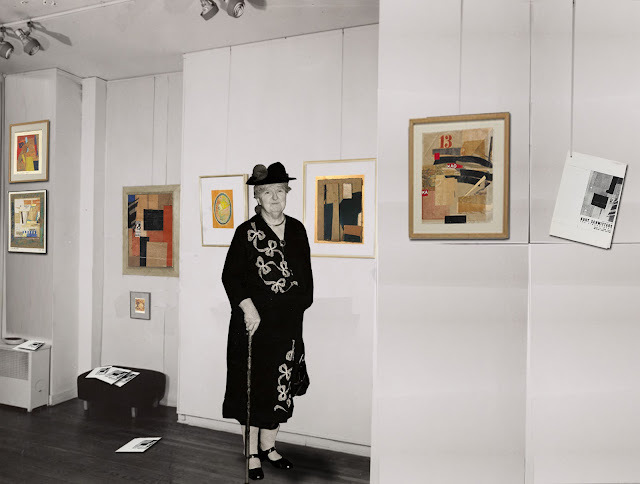 Katherine S. Dreier spoke with Rose Fried, director of The Pinacotheca and set this exhibition with the selected work and sent by Kurt Schwitters that year (1947) and others from his own collection and friends, in total 26 pieces. The catalogue (which we see hanging on the right wall and in the background) has a small and endearing introduction by Dreier and a text by Naum Gabo recalling the 20s when he was walking with Kurt in Hanover and he was collecting pieces of paper that he carefully and lovingly cleaned and fit in an elegant way in a Merz collage following a preconceived design. 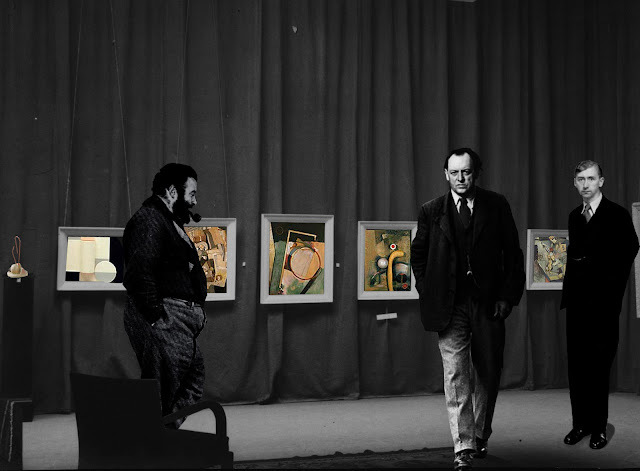 The exhibition Gedächtnisausstellung Kurt Schwitters, (commemorative exhibition) was also held in Basel on 28th February 1948 at the Galerie d'Art Moderne, with 35 works, but of which there is no catalogue.